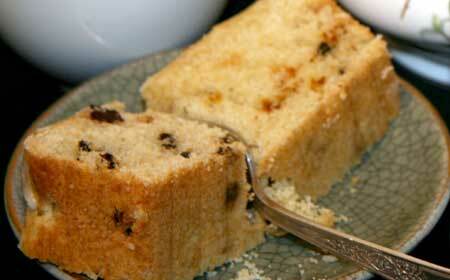 “This moist, easy-to-make tea cake provides excellent light refreshment, for any occasion. The tiny delicate Zante currants, included, add a traditional European touch. Serve it lemon, or vanilla glazed. Wisk together in a medium bowl, the egg, oil and milk. Add package contents and mix thoroughly with a spoon. Level batter into prepared pan. Bake 40 to 45 minutes, or until a pick inserted into the center comes out clean. Cool 10 minutes on its side in the pan. Remove from pan to wire rack. Optional - glaze now, while warm. Lemon Glaze: Mix together 1/3 cup powdered sugar with 2 teaspoons of lemon juice (bottled or fresh). Spread over the warm tea cake. Top with grated or zested lemon rind if desired. Vanilla Glaze: Mix together 1/3 cup powdered sugar with 2 teaspoons of milk and ½ to 1 teaspoon of vanilla. Spread over the warm tea cake.